Development Centres (DCs’): Evaluating the Effectiveness through Kirkpatrick’s Model | Business Article | MBA Skool-Study.Learn.Share. There is no dearth of research published on the contribution of HR. Some say HR should be a “business partner” or a “business player’. For others, an “employee champion”. But leaving the jargons aside can we really develop one concrete role for the department? Experts say yes and point to the role of HR in talent management. A decade back, McKinsey & Company in its article mentioned the need for companies to prize its most important asset-talent, pointing to evidence across industries. “Strong talent in key positions creates huge improvements in performance. For instance, in a manufacturing company, the best plant managers grew profits 130% while the lowest performing managers achieved no improvement. In an industrial services company, the best centre managers grew profits 80% while the lowest performers achieved no improvement. In a financial services company, top performing portfolio managers grew revenues by nearly 50% while average performers’ portfolios remained flat.” (The war for talent-Organization and Leadership Practice, 2001). More recently, a study from The Hackett Group revealed that companies with more mature Talent Management capabilities can reap strong bottom-line benefits, including earnings that are 18 percent higher than typical Global 1000 companies” (Research Alerts & Press Releases, 2009). With so much evidence in favour of talent management, it’s a no-brainer that we need to incessantly engage the HR department in building a strong, talented workforce. But the question is how do we do that? One of the most popular and frequently used methods is ‘Development centres’. Development centres (or DCs’) is a tool where candidates are evaluated by multiple trained assessors on competencies that have developed for their current /next role using a variety of assessment techniques like role-play, group discussion, case study etc. This assessment is basically done to provide ‘feedback’ on areas of strength and development in order to better perform their role/next role. Later, the candidate is expected to review the feedback given and create an Individual development plan (IDP) in order to address these development needs. The development plan has to be made by each candidate in consultation with their reporting managers with a focus on learning interventions such as coaching/mentoring, training or any special on the job assignments. Everything sounds good till now, right? But the big question that every HR person today faces is- ‘How do we, as HR people, provide evidence to our line managers that the program did indeed have a positive impact on the participants?’. How do we know that our best bet to remain visible in business is really working? How do we show that DCs’ were indeed effective? 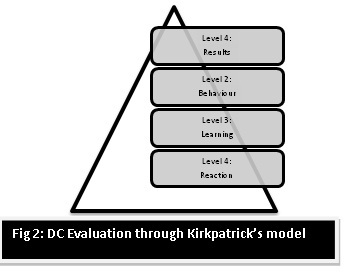 A possible way we could evaluate the effectiveness of DCs’ is by applying the Kirkpatrick’s model of training evaluation. How well do the trainees like the program? What principles, facts, and techniques did the trainee understand and absorb? Did the trainee change their on-the-job behaviour? Support offered by the HR team (or team handling DCs’). But organizations would do better in obtaining feedback from all constituents involved in the DC process. These include the participants, assessors, line HR, DC consultant (if involved) etc. The focus is to improve the process further by analyzing the feedback of all people who significantly contribute to the success of the DC program. Most organizations end their DC evaluation at the reaction stage without moving further to see if the participants really gained any learning from the DC program. That’s what Level-2 will measure. Now in DCs’ the assessors usually provide feedback to each participant at the end of each exercise. Are the participants really attentive? Was the feedback internalized by all of them? You can check this by providing a ‘Learning Journal’ to each participant to capture their feedback. Our aim is to help them imbibe all the feedback they receive rather than put them to a test. In fact the same feedback can be used as an input in the creation of an Individual development plan (IDP), prepared by the participant in consultation with his/her reporting manager at the end of the DC program. Level 3 will provide you data that will be music to the ears of line managers. They nominate their subordinates to DCs’ in the hope that, in future, these subordinates will take over from where they left by exhibiting behaviours crucial for their role over a period of time. Evaluating Level 3 involves checking the application of the feedback received, which most organizations do by reviewing the IDP created by the participant at the completion of a year post-DC. But providing a 360 degrees feedback to the participant post a year will really help analyze if the organization is seeing a change in behaviour of the participant. A 360 degrees feedback through a self- assessment, peers, subordinates and the reporting manager will clearly show if the participant has exhibited the behaviours on the job. Level 4 is something that is difficult to check as DCs’ are designed to provide feedback rather than drive business impact. However specific business measures can be developed by the participant and the reporting manager post the DC. For instance, if innovation is a developmental need of the participant then the reporting manager can put him/her through a special project (team based or individual) on innovation which requires him/her to deliver on certain deliverables and timelines(in other words results). The purpose of this article was to drive the HR team to focus on its ‘core competence’, which is leadership development. In fact the future of HR would to large extent depend on its ability to create a continuous flow of strong leadership pipeline. DC’s as a process will be used as an approach to leadership development by organization but what will distinguish a good from a great DC process will be the HR’s focus on continuous improvement of the process through evaluation. This article has been authored by Sheldon Carvalho from Mahindra & Mahindra.